Scisnack | Can conservation agriculture solve the food security crisis in Kenya? There are 33 million people in Kenya and this number is increasing every year. Have you ever imagined how hard it will be to feed this growing population while our climate is changing? We know that rainfall has been decreasing and droughts increasing year after year, putting our smallholder farmers at ever greater risk. Adopting conservation agriculture may not only help farmers produce more but also protect them against the effects of climate change. This is also a good idea because we need to think in terms of “sustainable development”, which involves changing our farming methods, looking after our environment, nurturing our limited natural resources, and protecting Kenya for future generations. Approximately 1.6 million children under the age of five from arid and semi-arid lands (ASALs) in Kenya are suffering from malnutrition. Women are not far behind, especially those that are pregnant or those nursing young children. Where have we gone wrong as a nation? We should not be continually crying for help from donors and our nation should not be dependent on relief food. We have cut down trees, we have ignored research results from our scientists and politics is the order of the day. We have large areas of precious land at our disposal which, if put to proper use, can transform our well-being. Our agriculture is dominated by smallholder farmers who depend on rainfed agriculture. They have limited resources and lack the capacity to take advantage of new research and modern farming technologies. We need to educate our farmers on the benefits of using the right seeds and the right amount of fertilizer. We need to transform our agricultural land by adopting sustainable farming practices that are friendly to our environment, can conserve soil moisture, can save on labour costs, and will reward our smallholder farmers with increased yields, improved family income and, ultimately, result in the eradication of poverty. Conservation agriculture can help to achieve these objectives as it has clearly shown to result in higher and more stable yields than traditional farming methods. 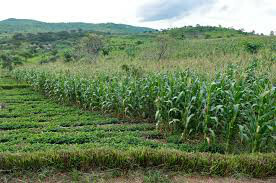 Conservation agriculture has been defined as a resource saving agriculture which strives to achieve acceptable profits together with high and sustainable production levels while concurrently conserving the environment. It is characterized by three main principles: minimal mechanical soil disturbance, permanent organic soil cover, and diversified crop rotations” (FAO, 2013). Figure 1: A conservation agriculture model (Owiti, 2014). Conservation agriculture has already been tried in countries like Burkina Faso and Malawi, and has solved their food shortage challenges. There is now plenty of food to feed the entire populations of these countries, and a surplus available for sale. Conservation agriculture has been shown to make operations more efficient, reduce input costs, increase crop yields, and increase farm incomes. It also involves crop diversification which translates into varied nutritional components resulting to a healthier nation. The soil is nourished through the retention of crop residues on the farm which means that there is less need for artificial fertilizers, which in turn translates into reduced nitrous oxide emissions and hence a reduced impact on the climate system. After passing on the benefits of conservation agriculture, how then do we get our smallholder farmers, especially those in ASALs, to practice this excellent farming method? This will require empowerment of our agricultural extension officers so that they, together with other stakeholders who work closely with smallholder farmers, can reach out and educate the smallholder farmers on the benefits of conservation agriculture. The right policies need to be in place and institutional collaboration needs to be encouraged. Just imagine, if we can adopt conservation agriculture across the whole of Kenya we will be able to provide food security for all and be assured of having enough food in future to feed the growing population. Communicating the value of conservation agriculture and empowering our smallholder farmers is the only way we can ensure that our own Kenyan farmers are able to feed the entire Kenyan population. Dorcas is an experienced agricultural professional with keen interest to work with smallholder farmers at community level. She is currently undertaking her PhD in Climate Change and Adaptation at the University of Nairobi. Her research interests is to device climate smart technologies which would transform farming communities through improved resilience and food security in the face of climate change. Tagged Conservation agriculture, Food Security, sustainable development.